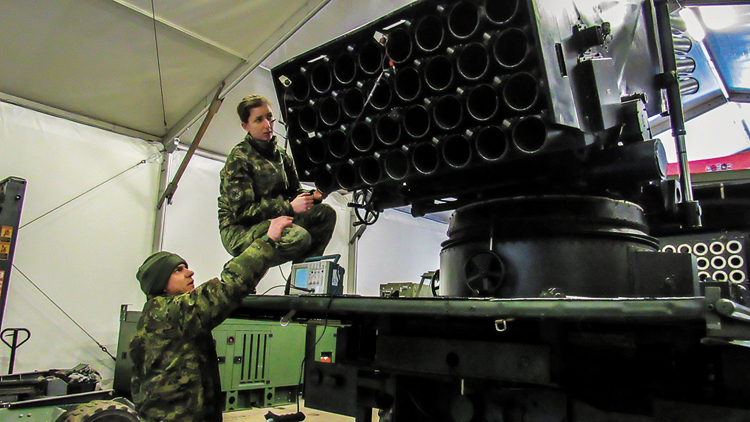 The Self-Propelled Multiple Rocket Launcher Battery of the Mixed Artillery Battalion of the Guards Mechanized Brigade of the Croatian Army makes up the main force of the 3rd Croatian Contingent, which has been a part of the Battle Group led by the United States of America in the operation Enhanced Forward Presence (eFPBF-USA) since October 2018. The Self-Propelled Multiple Rocket Launcher Battery is a mixed-artillery unit belonging to the combat support branch and their main weapon is the M-92 Vulkan mobile multiple rocket launcher. Like any lay person whose knowledge of vehicles does not go beyond turning on the ignition key and driving, I was intrigued by the frequent stories about the state of the vehicles. While it snowed outside for the umpteenth day in a row, I spoke with Staff Sergeant Matić in an improvised technical workshop in a tent. It is quite cold in the tent, but everybody is working at full steam because the weekly inspection of the vehicles is coming up. With a cup of hot tea in my hands that warms my throat and my slightly frozen fingers, I ask Sergeant Matić what his team do. In a soldier-like manner, feeling slightly uncomfortable as he is not used to giving interviews to and being photographed by a public affairs officer, he responds: “As the Commander of the Logistics Support Squad, my task is to maintain motor vehicles and the Vulkan rocket system.” As a true commander, he immediately names his men: “The squad is made up of a motor-car electrician, Private First Class Josip Leskur; a gun-smith, i.e. a small arms repairer, Private Ante Jelinčić; a wheeled vehicle mechanic, Private Andrija Marušić; and a rocket system NCO, Corporal Military Specialist Ivan Štrbac.” I begin to understand why the atmosphere in the tent is rushed. The five of them, each specialized in one field, maintain the contingent’s motor pool. The team also includes the drivers of these vehicles. As Sergeant Matić says, a job cannot be done properly if the drivers and the squad do not co-operate with and trust one another. I turn around. Each man is focused on his task. My eyes wonder to Private Marušić’s black hands looking for a screw-driver in the tool shed. I take my camera and head outside to see what he is working on. He checks the coolant hose. True, such a task has no importance for the Battery’s combat readiness. Nevertheless, it is nice to see someone do their job with such precision that they almost do not notice my attempts at taking a photograph under the engine lid. On the other side, motor-car electrician Leskur checks the wirings on a MAN truck, while Military Specialist Štrbac conducts the second technical inspection of the Vulkan before a target practice. He is the one who confirms the technical validity of the M-92 Vulkan rocket launcher before a rocket target practice. Gun-smith Jelinčić dismantles the HS2000 pistol after a target practice and cleans the firing pin so that the pistol can continue functioning flawlessly. 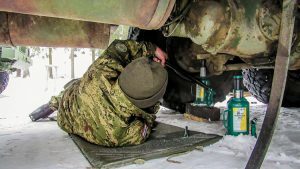 Meanwhile, Sergeant Matić checks the recently replaced tyre on an FAP truck. As we talk about what a well-played team they are even though they only first met at the pre-deployment training, a colleague calls him and asks him if he could repair the leg of the foosball table in the activity room. Sergeant Matić laughs: “No problem; whatever you need.” This explains why the contingent have dubbed the men in the squad “hands of gold”. 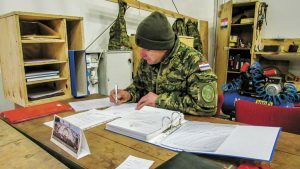 They are here to fix everything necessary for combat and everyday life in their base in the north of Poland – from motor vehicles and rocket systems to table football, chairs and doors.